Drillings for gas and oil are currently performed on land but also along the coast of British Guyana. The drillings are at an advanced stage and the prospects are very positive, said De Meza. 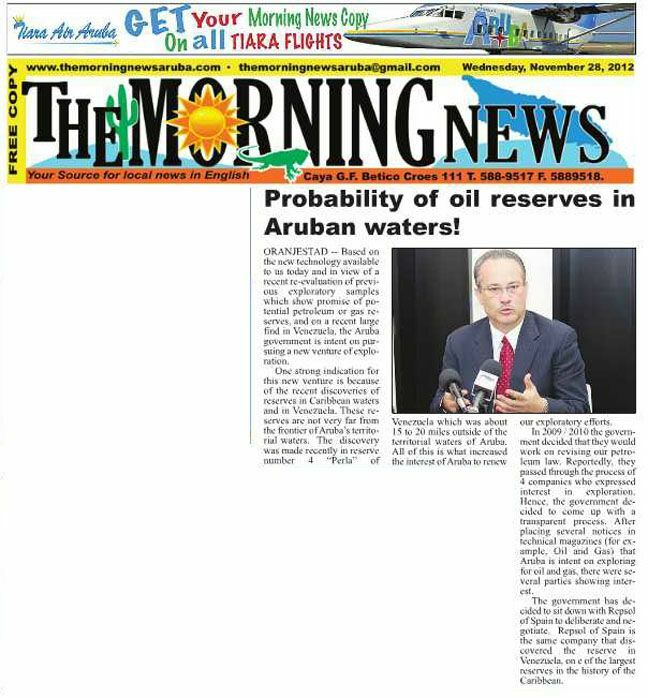 “This information is very interesting for Aruba because for two years we’ve been negotiating with energy companies on the exploration of gas in our waters. We are now only negotiating with the Spanish energy giant Repsol”, said De Meza. If the parliament approves the project the first seismographic tests in the territorial waters of Aruba will take place at the beginning of the first quarter next year. According to the minister, there is special interest for the northern part of Aruba; an area extended over 200 miles with a deep sea-floor. After the team has interpreted the results of the two-dimensional tests, three-dimensional tests in specific zones will be done shortly afterwards. These will be followed by exploratory drillings and hopefully we’ll find oil or gas. “We assuming more gas will be found than oil”, said De Meza. ORANGE CITY - Coverage in Asian media, in which Jiang Jiemin CEO denies knowing of a deal with the Valero Aruba refinery here has led to controversy. For example, yesterday by parliamentarian Booshi Weaver States submitted Questions about the future of the oil refinery in San Nicolas. In addition, the MP Minister of Finance, Utilities, Communications & Energy Mike de Meza (AVP) to a quotation from Brazil who would lie on the table. In the article that caused the fuss, says Petro China CEO Jiemin last Wednesday that he was "unaware of any deal" but that the purchase of the Valero refinery in Aruba is something where the company might be looking at. In early May Reuters had yet know that Petro China has expressed interest to the refinery for $ 350 million to buy. The CEO showed Wednesday know this year will focus on storage and refining capabilities in North, Central and South America as part of a plan for an overseas operation center to set up. Allows the company wants to trade with this part of the world promoting. Since last year, PetroChina, the largest producer of crude oil in the world. The minister earlier this week showed Meza still know that the negotiations between Valero and PetroChina have ended in a final stage. "The icing on the cake," said De Meza. The Daily Herald this morning managed not to get in contact with the Minister for a response. In his Questions to the States Meza Weaver asked for clarification on the ruling of CEO Jiemin. He also asks for clarification on the contents of the Memorandum of Understanding (MOU) between the Aruban government and PetroChina. The MOU would be Wever already been received by the ASF fraction. The opposition is devoid of information that could be decisive for the outcome of negotiations with PetroChina, said the parliamentarian. The Chamber of Commerce was previously called on the government to openness about the contents of the MOU. Chamber president Jamal Khan Mahawat will not publish the agreement, not transparent, so he let know. WILLEMSTAD — There’s natural gas under the territorial waters of Curaçao, Minister Charles Cooper (Traffic, Transport and Regional Planning, MAN) declared before radio station Z86 this afternoon.According to the minister, the petroleum law that is to form the legal framework for the exploration of natural gas and petroleum under the territorial waters of Curaçao is ready and was sent to the various advisory organs. Cooper doesn’t preclude there is petroleum on Curaçao but emphasized this was certainly the case regarding natural gas. For that reason, he is very positive about the economic prospects for Curaçao. This natural gas is located at a great depth under the sea and it’ll involve a substantial amount to get it to the surface. Minister President Mike Eman was present during the meeting between Minister of Finance and Energy, Mike de Meza with Valero executives. He explained that both the government and Valero are awaiting a decision by PetroChina. "Naturally we know that this cannot last an eternity, that is why we are all very interested in a rapid manner to get clarity on what decision will be taken in Beijing," Eman stated. He added that everything indicates that PetroChina's decision will be positive. Valero executives have also expressed that they are optimistic that PetroChina will come forward to purchase the refinery. A decision is expected in the next few weeks. ORANJESTAD — The principle agreement between the American oil company Valero and the Chinese state-owned company Petrochina on the purchase of the refinery on Aruba is finalized. Petrochina now awaits approval from Beijing. Premier Mike Eman (AVP) stated the aforementioned after conversations with executives from Valero late last week.The premier described the principle agreement between Valero and Petrochina, which is not the same as the MOU between Petrochina and Aruba, as ‘phase one’ of the selling process. The second phase is the approval of the agreement and the final decision to take over the refinery from Valero. This approval could take a while, said Minister of Finance, Utilities, Communication & Energy, Mike de Meza (AVP). ORANJESTAD — A group of concerned citizens want to press charges again the refinery in San Nicolas because of pollution and damaging consequences to health. Lawyer John Zara, who says the group hired him, speaks of the ‘billion dollar lawsuit against the refinery’. At this moment, the refinery is still in the hands of the American company Valero. Spokesperson Bill Day stated this morning he wasn’t informed of the plans for the lawsuit. Valero Refining Company-Aruba N.V., a subsidiary of Valero Energy Corporation (NYSE: VLO), today notified employees of the Valero Aruba Refinery that Valero has decided to further reduce operations and reorganize the site as a refined products terminal. "We believe that Aruba has the assets to compete as a world-scale crude and refined products terminal," said Valero Chairman and CEO Bill Klesse. "With both deepwater berths and smaller berths, the terminal will have the flexibility to load the very largest crude ships. In addition, the scale and mixture of tankage will permit commercially attractive storage opportunities for our customers. Aruba's proximity to growing markets and its business-friendly political environment make it an ideal location for our new terminal operations." Terminalling activities will, however, require a considerably smaller workforce. The reorganization and reduction in workforce is expected to be complete before the end of 2012. Valero will continue to supply jet fuel, gasoline, diesel, and fuel oil to the island, as well as engage in third-party terminal services. In this terminal operations mode, Valero will continue to be a significant employer in Aruba, and will continue to invest in Aruba with facility improvements and dock and tankage upgrades. Valero human resources representatives will begin meeting with refinery employees this week to explain the staffing selection for the terminal operations. A fair and reasonable arrangement will be presented to those employees not selected to be a part of the terminal operations. Valero will provide resources to assist in their transition to other employment. Valero suspended refining operations at the plant in March and has maintained the refinery in a state that would allow a restart. Valero has also kept its employees on the payroll pending this decision. In the near term, the refinery will continue to be maintained in a state that would allow a restart should Valero be successful in the pursuit of alternatives for the refinery prior to the transition to terminal operations. ORANJESTAD —Valero decided that yesterday was already the last day for most of the employees. The final date for the reorganization – through which more than 500 employees were forced to leave – was actually planned for today. The farewell had gone reasonably peaceful, according to labor union Iowua. Politicians from MEP and RED had come to hearten these employees. The American oil concern announced on September 3rd last that it will stop refining oil but will switch to transshipment and storage. Due to this reorganization more than 500 of the almost 600 employees are to leave. Attempts earlier this year to find a business or take over partner to restart the oil production, failed. After the production was halted in March, a take over by Petrochina seemed near at hand. The government signed a declaration of intent with the Chinese state-owned oil concern in April but the contents were never made public. Several months later the government hinted an agreement was close at hand, but the parties never reached an agreement. Valero never commented on a possible take over or partnership with Petrochina, or on negotiations with other companies. The refinery at San Nicolas has been closed now for approximately eight months. ORANGE CITY - Valero no longer appears in the LNG project to sit. The American oil company was the leader of this project that millions of investment required. But since Valero announced that they are provisional only goes into storage and transshipment of oil and thus not reopen the refinery, the company does not anymore. The government, however, continues with the gas project. This Energy Minister Mike de Meza (AVP) gezegt during the debate last week on the petroleum legislation to exploration for and exploitation of any oil and gas fields in the sea became possible. In July, the government signed with the Dutch gas distributor and gas company GasUnie Anthony Veder a Memorandum of Understanding (MOU). The aim of this collaboration was further research into how LNG in Aruba can be used, how it gets here, and where it is stored. This study is the minister late last month completed and now followed by a second study that addresses more 'engineering and calculation of the costs. That report shall in April / May next year ready. Then we can decide if we go, what investments are required and how we do that, says De Meza. Views should be or WEB (Water and Energy would then production must shift from diesel to natural gas) and Utilities (including the overheidsnv WEB falls) with Gasunie and forms a partnership or also with feather there. With natural gas, the Parties according to the minister possibilities such as a fuel supplier for cruise increasingly switching to gas as a fuel and also for the traffic on our island. It also fits in with the policy of the Government to switch to cleaner energy sources. The Minister emphasized in parliament that Gasunie and Anthony Veder have indicated they are not interested in selling gas to Aruba. It involves the distribution and knowledge sharing, says De Meza therewith criticism include the opposition wegwuifde. How and where the gas comes from, is also still an open question. ::snipping2:: Aruba looks over to other countries such as Trinidad & Tobago and the USA as a possible future gas suppliers. ORANJESTAD — A group of telecommunication companies, which included Setar, signed a contract last Thursday with which Aruba will be connected via the Pacific Caribbean Cable System. This expansion of capacity is due to a growing demand for online contact and digital TV.It regards a 100 G glass fiber cable of 6000 kilometers between Florida, US and Ecuador. With that the system also connects the islands of Tortola, Puerto Rico, Columbia (Cartagena), Panama (Maria Chiquita and Balboa), Curaçao and now Aruba. The contract was signed on Aruba also by telecommunication companies: Cable & Wireless Communications, Setar, Telconet, Telefónica Global Solutions and United Telecommunication Services (UTS). ORANJESTAD — At the Dr. Edward Cheung Center for Innovation, Compania Arubano di Petroleo (CAP) and the Spanish oil and gas company Repsol signed the contract on Tuesday December 4 for exploration of the Aruban seafloor for petroleum and natural gas. 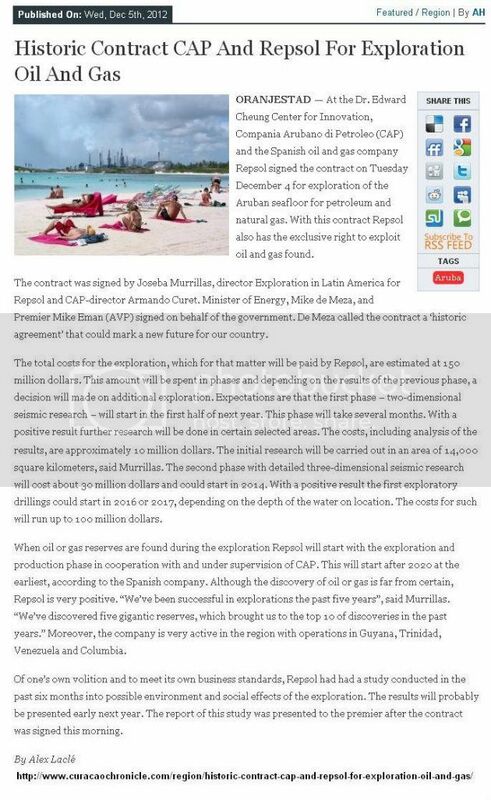 With this contract Repsol also has the exclusive right to exploit oil and gas found. The contract was signed by Joseba Murrillas, director Exploration in Latin America for Repsol and CAP-director Armando Curet. Minister of Energy, Mike de Meza, and Premier Mike Eman (AVP) signed on behalf of the government. De Meza called the contract a ‘historic agreement’ that could mark a new future for our country. The total costs for the exploration, which for that matter will be paid by Repsol, are estimated at 150 million dollars. This amount will be spent in phases and depending on the results of the previous phase, a decision will made on additional exploration. Expectations are that the first phase – two-dimensional seismic research – will start in the first half of next year. This phase will take several months. With a positive result further research will be done in certain selected areas. The costs, including analysis of the results, are approximately 10 million dollars. The initial research will be carried out in an area of 14,000 square kilometers, said Murrillas. The second phase with detailed three-dimensional seismic research will cost about 30 million dollars and could start in 2014. With a positive result the first exploratory drillings could start in 2016 or 2017, depending on the depth of the water on location. The costs for such will run up to 100 million dollars. When oil or gas reserves are found during the exploration Repsol will start with the exploration and production phase in cooperation with and under supervision of CAP. This will start after 2020 at the earliest, according to the Spanish company. Although the discovery of oil or gas is far from certain, Repsol is very positive. “We’ve been successful in explorations the past five years”, said Murrillas. “We’ve discovered five gigantic reserves, which brought us to the top 10 of discoveries in the past years.” Moreover, the company is very active in the region with operations in Guyana, Trinidad, Venezuela and Columbia. Of one’s own volition and to meet its own business standards, Repsol had had a study conducted in the past six months into possible environment and social effects of the exploration. The results will probably be presented early next year. The report of this study was presented to the premier after the contract was signed this morning.